Excitable Educators: So ... Did It Work?! So ... Did It Work?! This is a period of transition for us here at Akoranga o Naenae, as we finish our evaluations of Round 1 and begin anew with 48 eager students for Round 2. As we said at the beginning, Akoranga o Naenae is based on a hunch, with the main principles well researched. 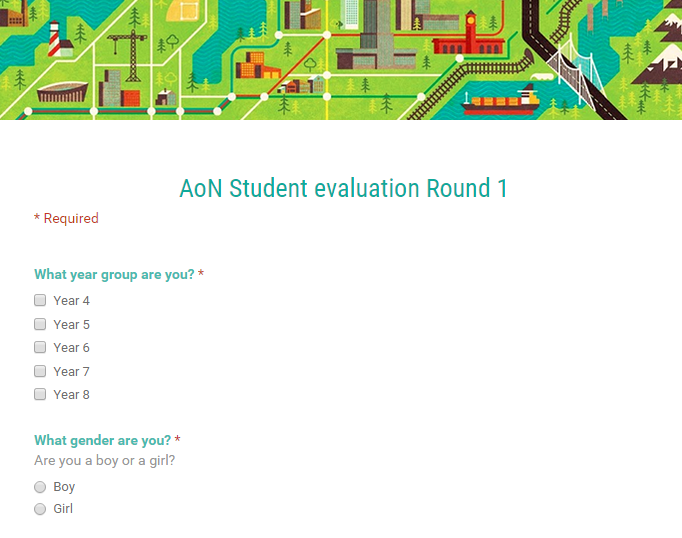 Now we wanted to determine whether or not AoN has proven itself effective. Our chief supporters, our network leaders, are realistic and experienced people. They know that change takes time, and have not put unfair expectations on us. However, we always knew that we would have to prove ourselves pretty quickly to ensure that we could continue AoN. 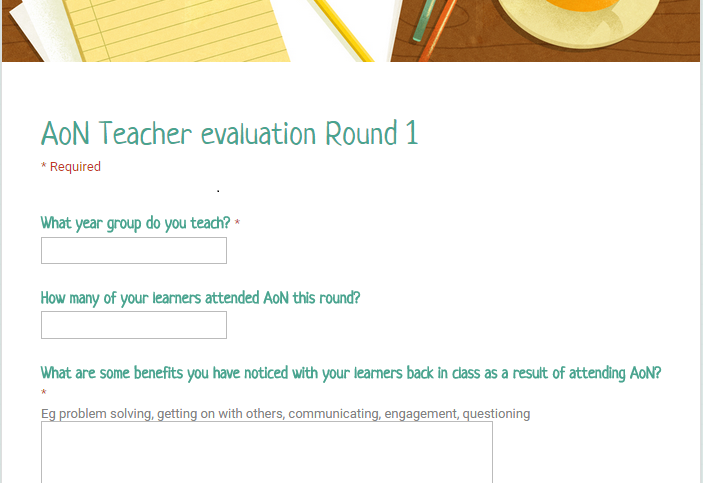 As such, the evaluations from Round 1 have been much anticipated (particularly from data geeks like me!) Keep in mind we had (only) 14 days with our learners. As with most things at Akoranga o Naenae, when considering methods for collecting evaluations, we tried to think outside the box. As there was not one tool that was going to give us all the information we needed, we used a variety of tools, and we asked everyone who had been involved for their perspective. 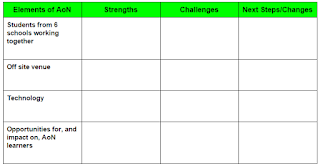 These included self-assessment, questionnaires, video recordings, and reflective discussions. These three key points showed us that the learning had been effective for many of our 48 learners. 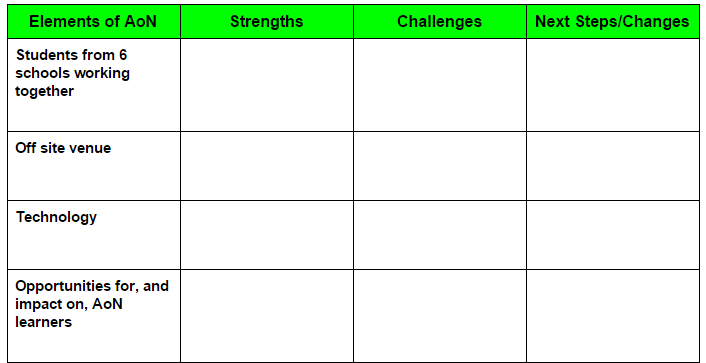 Bearing in mind that many, if not most, of these kids are priority learners, whatever impact we had (positive or negative) was always going to be important. We were pretty excited by this results, and proud of what we all had achieved over 14 days. It gives us more confidence to hope (as we always have) that AoN might end up being one of the things that leads to improved academic success for some of these students. We have anecdotal evidence from several kids, families, and leaders to say that they have seen just that. Kids telling us about how they used not to be at the National Standard, and now they are; parents describing their child as 'sky rocketing' at school; and leaders collating data on their eight AoN students, showing significant improvements in reading, writing, and maths. they really enjoyed the food we had on our Learning Maps days!! So, overall, did AoN 'work'? Did the 14 days we spent together make a difference to these students? Did it help them to build skills and understanding about how they can enhance the way they learn in all areas of their lives? It sure did! In the words of one of our students: "Akoranga o Naenae changed my life". As active learners ourselves, we're not stopping there! How do you feel about AoN finishing? This is just a snippet of what we wanted to say. If you have any questions or want further information, please contact us. We'd be really excited to talk about these evaluations in more depth. I love that your reflection was based on so much data, but more importantly- it was a range of different kinds of data (none of it NS!) and the data came from all the important people- kids, whanau, teachers and leaders. I am looking forward to seeing the principles of Akoranga o Naenae integrated back into the regular class more. Exciting times ahead!